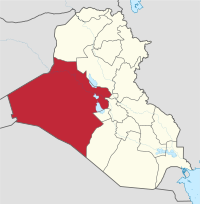 Al Anbar Governorate (Arabic: محافظة الأنبار‎; muḥāfaẓat al-’Anbār), or Anbar Province, is the largest governorate in Iraq by area. Encompassing much of the country's western territory, it shares borders with Syria, Jordan, and Saudi Arabia. The provincial capital is Ramadi; other important cities include Fallujah and Haditha. The governorate was known as Ramadi up to 1976, when it was renamed Al Anbar Province, and it was known as Dulaim before 1962. A large majority of the inhabitants of the province are Sunni Muslims and most belong to the Dulaim tribe, all of which speak Arabic. In early 2014, the Islamic State of Iraq and the Levant, with the assistance of local Sunni militia, launched a successful campaign to seize control of the province from the Iraqi government. Numerous offensive actions were undertaken by the Iraqi government to remove ISIL's occupation of the province – the Anbar campaign (2015–16), the Western Anbar offensive (September 2017) and the 2017 Western Iraq campaign. The area was effectively recaptured by the end of 2017. US HEMTT carrying a Sikorsky CH-53 Sea Stallion helicopter crashed in Ramadi in 2005. The name of the governorate in Persian language means "warehouse" or "silo", from the verb, anbâshtan (to store, to warehouse). This was the last stop/warehouses on the old Silk Road toward Syria. The name is pre-Islamic. The name of the Governorate is taken over from a historic city that was originally located on its territory and whose ruins can still be seen 5 km northwest of Fallujah near the city of Saqlawiyah today. This city of Anbār (Persian: Peruz Shapur) was founded in the 3rd century by the Muntherids, and was before the Arab conquest in 634, the second largest city of Iraq. It was abandoned after the Mongol invasion in the 14th century. A pseudo-authentication is offered by proposing that the name is Arabic and stands for "granaries" in Arabic, further proposing the word Anbar (أنبار) to be the plural of Nbr (نبر) which meaning "grains". In reality, Nbr does not mean grain in classical or middle Arabic, nor commonly in modern Arabic. The name already in use in Pre-Islamic times during the Sasanian rule over Iraq long before any Arabic having introduced to an otherwise Aramaic speaking Iraq. Dulaim is the old name of the governorate due to the Dulaim tribe inhabiting the region. It was called also called Liwa Al-Dulaim (لواء الدليم) in the Ottoman period and Sanjak Al-Dulaim in the seventeenth century. Al Anbar was known as the Dulaim Province to the concentration of Dulaim Tribe in this region and before them it was informally named as Sanjak Al Dulaim. During the Ottoman period the province of Dulaim was created, today known as Al Anbar Governorate, in 1706 and appointed Sheikh Itha bin Hamad as its ruler. But it came into its current form in the 1930s when Iraq was monarchy. King Faisal I of Iraq visited the province on July 31, 1921. He was received by Sheikh Ali Al Sulaimani, the ruler of the province, and 6,000 members of the tribe. During the Abbasid era in the reign of Caliph Abu Abbas Muhammad in 134 AH, the second capital of the Abbasid Caliphate after Kufa to Baghdad where he built his palace in 145 AH. He built the road through the Euphrates River and the Mediterranean Sea to the Persian Gulf, so the armies entering and leaving Iraq are passing through this region. Anbar is one of the driest governorates in Iraq's western desert climate. Some of Al Anbar is part of the Syrian Desert, characterized by steppe and desert terrain. Most of Al Anbar is considered as a topograhical continuation of the Arabian Peninsula plateau region. It has some small hills and a number of wadis (Valley), including Wadi Rordan. Given a decline in land preservation and a lack of natural vegetation, the land is often exposed to the elements and prone to severe erosion. Among the most important agricultural crops are Potatoes, which are harvested in spring and fall. Wheat, Barley and maize (corn) are also commonly grown in the governorate. Al Anbar is also known for the production of phosephates and fertilizer. It is also rich in mineral such as sulfur, gold and oil . However, Anbar has not been extensivly explored for oil. In the 1920s, the governorate had a population of 250,000, as did Baghdad, out of a total population of 2 million in Iraq. Today there are 9 million people living in Baghdad, among them a million Anbari people in the city and suburbs; their origins are the people of the Al-Anbar tribes that have moved to Baghdad during the past 500 years and their recent migrations there during the 1920s and 1930s. Half of the residents in Anbar are living on the banks of the Euphrates River outside cities and the towns, there were between 1.9 million and 2 million inhabitants in the districts of Al Anbar. The largest cities are Ramadi (pop. 900,000) and Fallujah (700,000). According to UN estimate in 2003 the population of Al Anbar is 1,230,169. There are no precise estimates of the population which include all of the cities and towns and villages in Anbar. According to a 2003 estimate by the NGO Coordination Committee in Iraq, the population was 1,230,140. It is estimated that around 90 percent of Anbar's inhabitants are adherents of the Sunni branch of Islam. The remaining ten percent are either Shi'ites or Christians. The governorate contains a lot of Masjids, monuments, and shrines. The geographic challenge of the Anbar Governorate is demonstrated by two contrasting facts: while it is Iraq's largest governorate, it also is its most sparsely populated. For a governorate that is approximately the size of Bangladesh, it is home to fewer than 1.8 million Iraqis. Most of the population lives in the major cities, like Ramadi and Fallujah, and almost everyone else lives within a short distance of the Euphrates River that snakes from Baghdad to the Syrian Border near Al Qa'im. Its strategic challenge was demonstrated, in part, by casualty statistics. During the first four years of Operation Iraqi Freedom (OIF), the Anbar Province was the deadliest province for American service members, claiming approximately one-third of American fatalities. The Anbar Province was the Sunni stronghold that had long provided Saddam Hussein with the support he needed to remain in power. 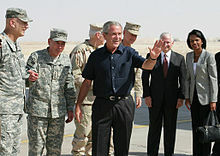 During the early years of Operation Iraqi Freedom, it provided an important base for Al Qaeda and insurgent operations. Part of its significance came from the fact that the Western Euphrates River Valley served as an important infiltration route for foreign fighters headed to Iraq’s heartland. The New York Times compared this region to the Vietnam War’s Ho Chi Minh Trail, as foreign fighters and insurgents used the river valley to move in relative safety from the Syrian border to cities like Baghdad, Ramadi and Fallujah. The contrast between the fertile Euphrates River Valley and the rest of the province is striking. Along the Euphrates, groves of fruits and vegetables and acre after acre of date palms are surrounded by a lushness that paints the area a vivid green. Just a few miles from the Euphrates, however, the barren landscape turns brown. With the exception of an occasional Bedouin, the desert is essentially empty. Whether traveling by aircraft, vehicle, or on foot, the Anbar Governorate is vast. During a time when mining roads became a strategy of choice for insurgents, the need to patrol and travel throughout the province became one of the Marine Corps’ greatest challenges. The threat of insurgent activity, when combined with the challenges that long-distance travel, choking dust, and stifling heat created, made the Anbar Province a difficult area of operation. ^ "Iraq: Governorates, Cities, Towns, Municipal Districts - Population Statistics in Maps and Charts". citypopulation.de. Retrieved 2018-01-01. ^ Omar Sattar (5 December 2016). "Has political crisis in Iraq's Anbar reached a dead end?". Al-Monitor. Retrieved 2017-01-03. ^ Parfit, Joseph T. (1920). Marvellous Mesopotamia, The World's Wonderland. London: S. W. Partridge & co., ltd. p. 15. ^ "UN Data 2003". iraqcoalition.org. Archived from the original on 2006-12-15. Retrieved 2018-01-01. ^ "Irakische Streitkräfte starten Rückeroberung Ramadis". Deutsche Welle. Retrieved 2015-05-26.